It's incredible to think that Burnley's next competitive fixture will be the first installment of a two-legged affair in the Europa League. The Clarets may have signed off from their most successful campaign since 1974 with defeat against Eddie Howe's AFC Bournemouth at Turf Moor but they'll now await the next step on this phenomenal journey, with the draw taking place in Nyon on June 19th. The club hadn't sampled European football for 51 years, since defeat to Eintracht Frankfurt in the quarter-final of the Fairs Cup, but supporters were given a reminder of those halcyon days when Andy Lochhead, Freddie Smith, Willie Irvine, Les Latcham and Jimmy Robson - Burnley's first ever goalscorer in Europe - were welcomed as half-time guests. Sean Dyche's side will have to go some to emulate that success, with three qualifying rounds needing to be negotiated to gain entry in to the group stages, but they'll go in to their first fixture on July 26th, a second qualifying round tie, having finished seventh in the Premier League on 54 points, five better than their nearest rivals Everton. After a typically 'end-of-season' feel to the game, with both sides taking a good quarter-of-an-hour to get going, it was the Cherries who went close to drawing first blood. Jordon Ibe's pull back picked out Lys Mousset in space but the 22-year-old Frenchman was denied by a fine one-handed save by Player of the Year Nick Pope, who dropped to his right hand side. Once Jeff Hendrick's deflected effort was comfortably gathered by Asmir Begovic, the England hopeful, who also collected the Players' Player of the Year gong, was at it again to beat away a Charlie Daniels attempt, with the 31-year-old putting his laces through Joshua King's assist. The hosts started to crank things up a little, moving the ball around well, and Jack Cork dragged a shot wide from the edge of the box after Hendrick spotted the midfielder in space. Moments later, Chris Wood's blushes were spared by the linesman's flag as the record signing somehow scooped the ball over from underneath the crossbar. Aaron Lennon had just strayed offside from Matt Lowton's perfectly measured slide rule pass, stepping ahead of Daniels, before rolling the ball across the six yard box to tee up the striker's blunder. 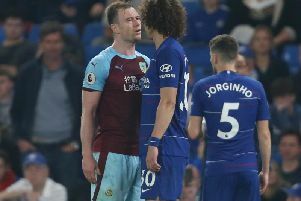 Wood, however, redeemed himself almost immediately when guaranteeing his place as Burnley's leading scorer this term to give the home side the lead. Ashley Westwood's strike from Stephen Ward's cross was travelling well wide but Wood's intervention made the world of difference as he stuck out a toe to divert the ball beyond a hapless Begovic in the 39th minute. Bournemouth battled back after the break and, after going close on a couple of occasions, they found an equaliser. Pope wasn't troubled when Nathan Ake's header dropped the wrong side of the upright but he may have been tested seconds earlier had James Tarkowski not thrown himself in to the path of King's volley from deep inside the penalty area. At the other end, Tyrone Mings's error, when misjudging Lowton's delivery, gifted possession to Wood inside the box and Hendrick was able to get a shot away from the New Zealand international's pass but Begovic was equal to the effort. The visitors pressed again with Ibe attacking Ward on the outside but the former Liverpool winger pulled his shot across goal and wide of the far post. But the visitors levelled in the 74th minute to move one step closer to avenging their defeat on the South Coast in November. Pope made another impressive stop to deny substitute Jermain Defoe, after Howe had rung the changes, but, with his defence doing him no favours, he was eventually beaten by King's right-footed strike. Callum Wilson, who was introduced alongside Dan Gosling just before the hour, went within a whisker of giving the away side the lead shortly after but his drive from 20 yards sailed wide of the post, with Pope seemingly beaten. Wilson went one better, however, in stoppage time and once again it was the Clarets who were responsible for their own unravelling. Defoe profitted from Long's slip, closed in on goal, drew Tarkowski and slid the ball to his strike partner who obliged by threading the ball beneath Pope to make it 2-1. Burnley couldn't force an equaliser but the introduction of Under 23s winger Dwight McNeil, making his first appearance for the senior side, capped a quite remarkable campaign.